Three-Day Amateur Boxing Tournament Comes to Punta Gorda, Fla.
CHARLOTTE HARBOR & THE GULF ISLANDS (Feb. 09, 2016) - Sugar Bert Boxing Promotions in partnership with the International Amateur Boxing Association (AIBA), USA Boxing, Title Boxing, and Team IP announced the Sugar Bert Boxing Title Belt National Qualifier Tournament June 10 – 12 at the Charlotte Harbor Event & Conference Center. Hundreds of amateur boxers, their families, coaches, and fans will converge in Punta Gorda with hopes of advancing to the National Championships in Kissimmee, Fla. – DISNEY WORLD. The Tournament is open to amateur boxers of all ages with three rings of simultaneous matches Saturday, June 11 from 10 a.m. -10 p.m. and the Championship Sunday, June 12 from 10 a.m. – 8 p.m. This USA Boxing Association Sanctioned event is a qualifier for the National Championships in November 2016. The total cost for boxers to compete is $35. The General Admission for spectators is $15 per day. 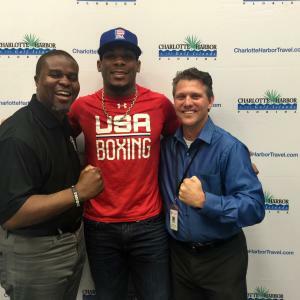 The Charlotte Harbor Boxing Club anticipates approximately five local boxers will compete in the tournament. It’s anticipated the event will attract 400 – 500 amateur boxers both male and female in all age groups and weight classifications. Sugar Bert Boxing Promotions (SBBP), owns and operates a large portfolio of boxers and boxing events worldwide. SBBP builds relationships with boxers, coaches, officials, parents, corporate sponsors, destinations, and local communities to provide unique opportunities for boxers and fans. More info at www.SugarBertBoxingPromotions.com About USA Boxing USA Boxing is the national governing body for Olympic-style amateur boxing. It is overseen by the United States Olympic Committee and the International Boxing Association (AIBA), who sets its rules.